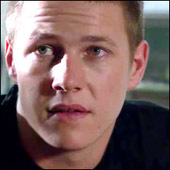 Brendan's arrival in the Bay was much anticipated as the small hints about his character had left the show's viewers very curious about him. Brendan, who is Austistic, visited his brothers Hugo and Xavier with his mother Gina and the bond with Xavier was immediately evident. He also took a liking to Rachel and Martha but his relationship with Hugo looked strained from the beginning. When Brendan accidentally injured Gina, breaking her ankle, Hugo insisted he stay in the Bay with them while she recovered. Despite Xavier having concerns about Brendan staying, they soon disappeared when his friends took to Brendan straight away, and vice versa. Brendan seemed to be integrating well into the community and his relationship with Xavier was endearing him to the shows viewers. However, that was threatened when Brendan fired a stone at Leah's car using a slingshot, forcing her to crash and seriously injuring Roman. Xavier struggled to cover for him because of his outbursts about the crash but Gina finally discovered the truth and Xavier confessed to the police. The situation also put a strain on Brendan's already poor relationship with Hugo but the family decided to go home for a few days and consult with Brendan's doctors about how best to help him. A few days later they returned to the Bay and found out that the police would not be talking matters further, much to everyone's relief. Following the incident Hugo decided Brendan needed more discipline and banned him from having sticks. Brendan didn't take too kindly to this and defied Hugo at every opportunity resulting in a number of fights. In one such struggle Brendan hit himself in the nose, causing it to bleed, and told everyone Hugo hit him. Despite Hugo protesting his innocence, everyone thought he had done it and the situation caused a lot of Austin history to be brought to the surfce. This ended up being a good thing as their issues got resolved and the boys bonded before Brendan left the Bay with Gina. Hugo also discovered why Brendan has such a problem with blue cars which allowed him to understand Brendan better. Brendan's stay in the Bay has also had it's fair share of lighthearted moments such as falling out of a tree and living to tell the tale, running around he house naked and covering his face in boot polish! His relationship with Xavier was also a highlight as their bond was portrayed very well on screen. Only time will tell if we see Brendan again but with his two brothers living in the Bay there is always that possibility. Joey's short stint in the bay was one of controversy both off the screen and on. First introduced as Aden's work colleague, a strong willed tomboy with a love of boats but who was becoming a victim of sexual harassment at the hands of fellow colleague Robbo. Having been threatened by Robbo that he could have her if he wanted, a scared Joey asked Aden to stay behind and wait for her but he abandoned her to go to Belle's aid and Joey, left alone, was raped by Robbo. Quitting her job on the boat, Joey eventually confided in Aden and he tried to convince her to go to the police. A further twist in the tale came when Joey came onto Nicole and Aden realised that she was a lesbian. Armed with this information he recruited Charlie to help convince Joey to testify. Scared that her brother would find out about her sexuality, Joey was reluctant but Charlie managed to persuade her to come clean. She eventually did but with devastating results as her brother threw her out. Moving in with Charlie, she became increasingly attracted to her older friend the more time they spent together. After a fun day on a boat Joey and Charlie came close to kissing, only for Charlie to back off. After finding out that Charlie had accepted a date with Hugo, she left the house for a motel but Charlie tracked her down and after a heart to heart they shared a kiss. With Charlie finally admitting her feelings and Ruby catching them kissing, Jarlie looked very much an on couple until Joey's brother hit Charlie with a sexual harassment charge. Told to stay away from Joey, a drunken Charlie fell into Hugo's bed and when Joey found out, she left the bay for a new job on The Whitsundays. Having been involved in not one but two controversial storylines and having become the first openly gay character since Christopher Fletcher several years ago, will we ever see Jarlie reunited? Unfortunately it was recently confirmed to BTTB that Kate Bell was unavailable to return to the show, due to may other work opportunities. Though of course you can never say never in Summer Bay, and the show have stated that they'd like to continue the storyline should Kate's situation change in the future. Trey Palmer was a typical wind up merchant at school in the mold of Aden, Ric, Axel and all those who have been there before him. Though very little in his behavior has made viewers warm to him, we did get glimpses of enough of his backstory to get the sense that there is more to Trey than meets the eye. When his father overheard him bragging to his mates about having a sexual relationship with Kirsty, he was too cowardly to put things right. Kirsty's attempts to persuade him to do the right thing did no good but she was the alibi he gave the police for where he was at Roman's accident. Unfortunately Kirsty was too scared to admit the truth, causing an angry Trey to lash out and Miles to hit him in defense of Kirsty. With a dislocated shoulder and a father hell bent on revenge things spiraled out of control for Trey. Jai found a picture of Trey from his old school and in a conversation with Miles he revealed that he was bullied at his last school for being fat and that his father was a hard man to talk to. Convinced by Miles to do the right thing, Trey remained a pariah with the town but with the viewers having seen a troubled past and a softer side to the school bad boy, it will be interesting to see which Trey Palmer we come to see on screen over the next few weeks.